On a crisp, clear morning in late November, the coffee and baked stuff were especially welcome as two dozen NCGS members gathered at the Larkspur Ferry Terminal to examine yet another piece of the jigsaw puzzle that is Coast Range geology. 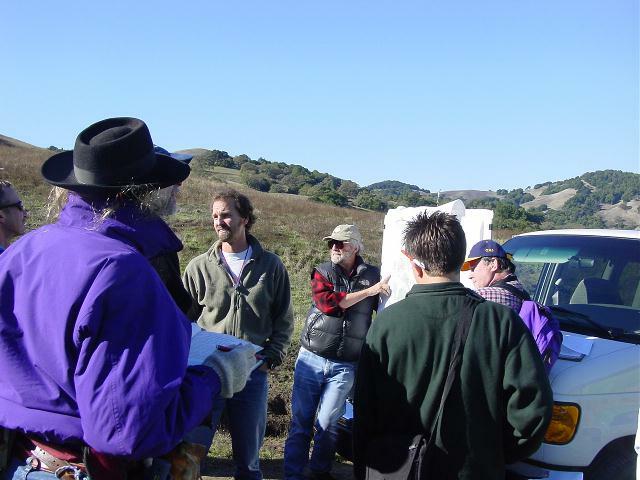 Venturing into the farm lanes and suburban streets of northern Marin County, we were ably led by Rick Ford, whose Masters work at San Francisco State has clarified the relationships along the little-known northwest-trending Burdell Mountain Fault Zone (BMFZ). His very useful 14-page guidebook is well worth having. 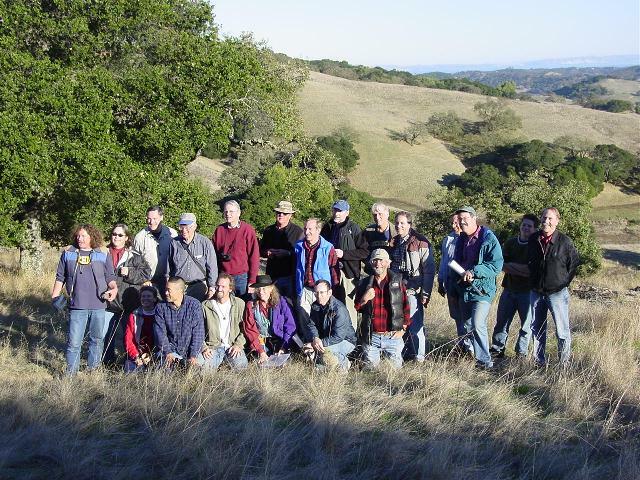 This was the third NCGS field-trip of 2003 into the North Bay region, examining work in progress by a joint project of the USGS (Bob McLaughlin and others) and the California Geological Survey (Dave Wagner), plus graduate students and faculty from SF State and San Jose State. 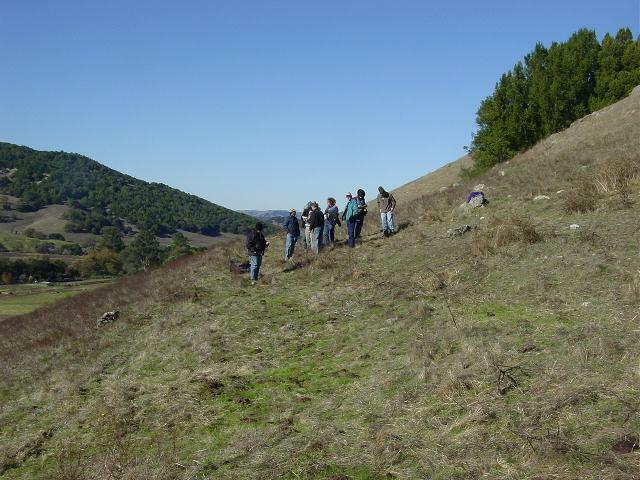 Previous trips had visited the Clear Lake Volcanic Field, youngest and northeasternmost of the North Bay Neogene volcanics, and the central belt of Sonoma and Donnell Ranch volcanics, ranging in age from 10.6 to 1.96 Ma. 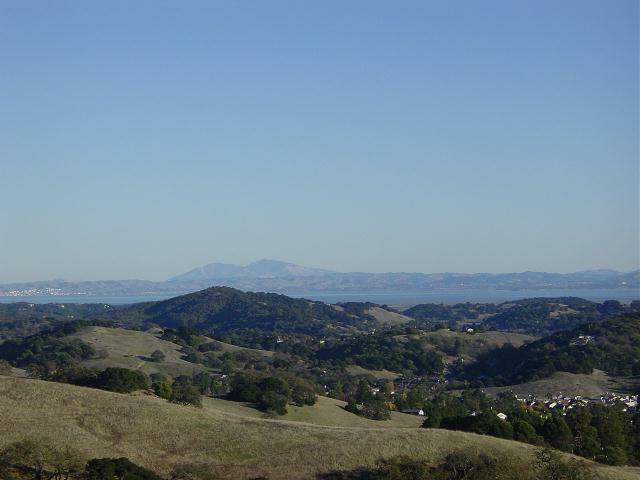 Today we would consider how the oldest and most westerly of the North Bay Neogene volcanics, the Burdell Mountain Volcanics, relate to these younger Neogene volcanics in the North Bay, and to the total San Andreas fault system. At our first stop, on the Marin-Sonoma county line about 2 miles west of Highway 101, we looked first at a roadcut in Franciscan rocks (serpentine and altered sandstone) northeast of the BMFZ. A few hundred feet to the west, across the road and a thick gouge zone, we then examined a low roadcut of Novato Conglomerate southwest of the main strand of the BMFZ. In the afternoon, at Stop 4, we would visit the type locality of the Novato Conglomerate, where Lower Cretaceous mollusks (Buchia) have been found in an underlying shale bed. Clasts in the Novato Conglomerate contain Buchia and a rhyolite porphyry dated (by K/Ar) at 138+/-4 Ma, indicating that the Novato Conglomerate is no older than Lower Cretaceous (Valanginian). The Novato Conglomerate at Stop 4 is on the northeast side of the BMFZ. Rick provided a clast count of the conglomerate here, and at Stop 1 across the fault and nearly 7 miles to the northwest. The clast counts and other features of the conglomerates at these two localities are remarkably similar, lending strong support to an estimated 10 km of right slip on the BMFZ. Stop 2 took us into the pastures of a hospitable rancher where we saw the BMFZ expressed as uphill-facing scarps, sidehill benches, and offset streams, features that suggest late Holocene movement on the fault. 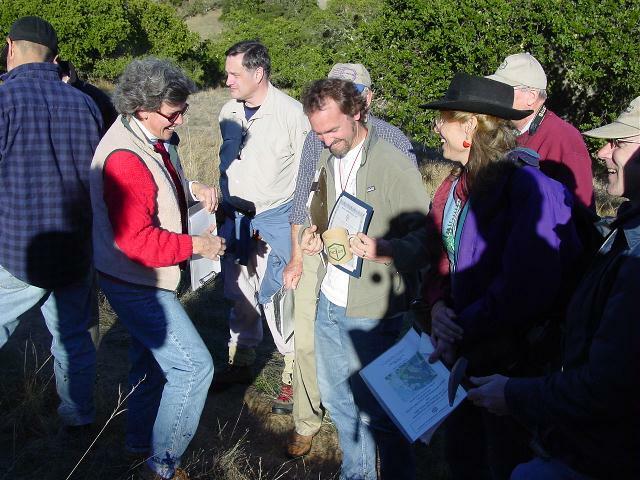 Field trip leader Rick Ford, with the assistance of Dr. Rolfe Erickson and Phil Garbutt at Stop 2. A view towards the west. 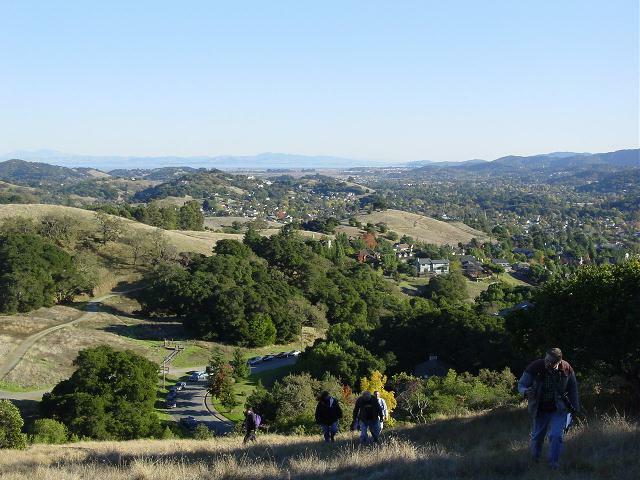 Looking northwest along the Burdell Mountain Fault Zone at Stop 2. In this area the BMFZ consists of several strands in a zone some 500 m wide. The total mapped length of the BMFZ is about 14 km; to the southeast it disappears beneath the wetlands adjoining San Pablo Bay and to the northwest it has not yet been traced within the sparse Franciscan outcrops of southwestern Sonoma County. For Stop 3 we drove south on Highway 101 and into Olompali State Historic Park, parked, and walked beyond the old adobe ruins that are all that is left of a 26-room mansion that burned in 1969. 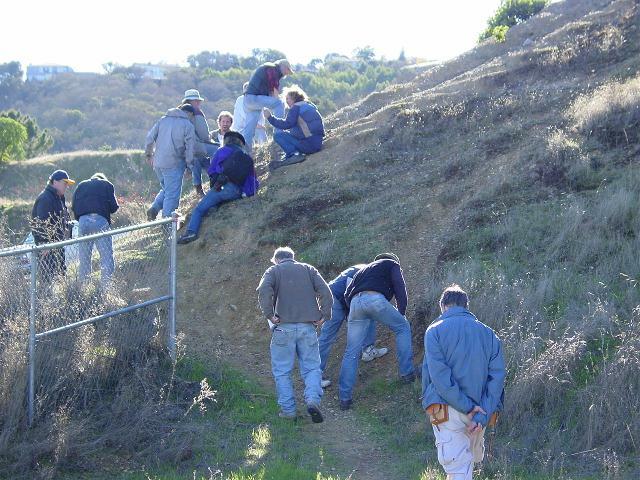 Crossing pastures and stone walls, we came to a 3-m high fault scarp along the BMFZ and continued on to where a waterfall cascaded down an 8-ft scarp of Miocene andesite typical of the Burdell Mountain Volcanics (BMV). Landslides blanket nearly the entire east side of Burdell Mountain (plus most of its south end and half of its western side) and it seems unlikely that this outcrop was in place. 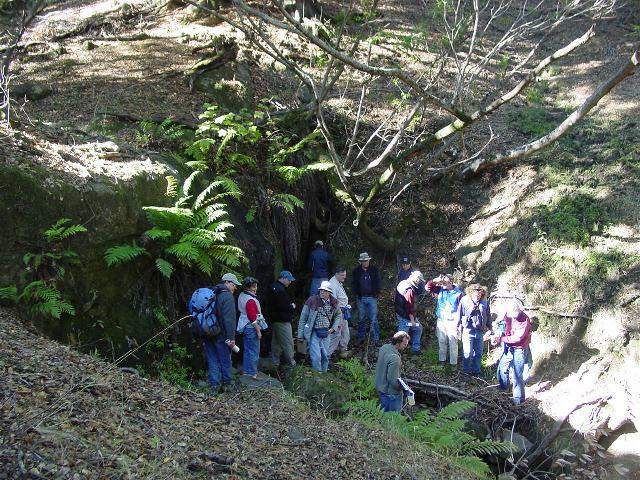 A visit to the “intact” porphyritic andesite that caps Burdell Mountain was precluded by steep trails and lack to time. En route back to the parking lot and lunch, I took a detour suggested by Rick Ford, and up a side creek found outcrops (possibly in place) of a Tertiary marine sandstone that underlies the BMV on the north end of the mountain, outside of the landslide areas. The stratigraphic sequence here – Franciscan Complex, Novato Conglomerate, marine sandstone (about 60 m thick), and BMV – matches very closely the sequence east of Hollister, where similar Franciscan rocks are overlain by Cretaceous Panoche conglomerates, sandstone and shale, by the early Miocene Lone Tree Formation (about 35 m thick and lithologically very similar to the sandstone at Burdell Mountain), and by the Quien Sabe Volcanics, also mostly a porphyritic andesite. The correlation between the two Miocene volcanic units had been in doubt because their K/Ar dates did not appear to match. But the newest Ar/Ar dates of 11.2 to 10.6 Ma from the BMV fit within the range of 11.7 to 7.4 Ma that constrains the age of the Quien Sabe Volcanics. 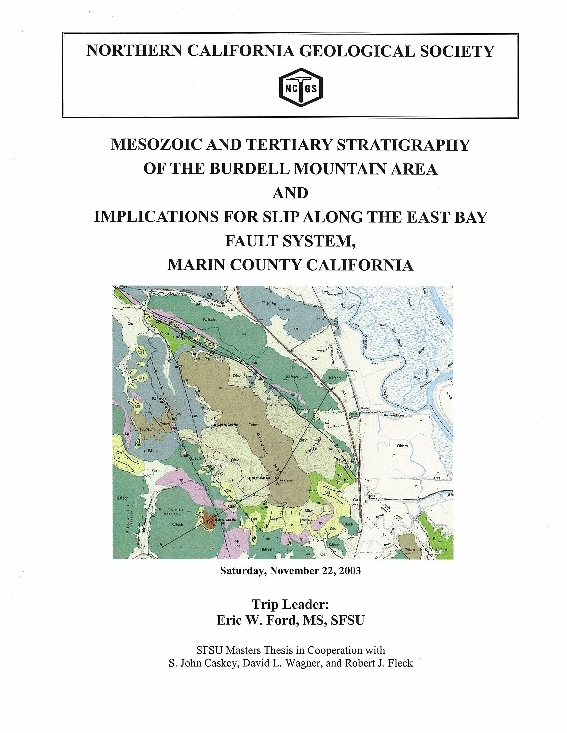 There now seems to be scant reason to question the correlation between the Burdell Mountain and Quien Sabe sequences, nor the 175 km of implied right-slip across the fault system (including BMFZ, Hayward and Calaveras) that separates the two areas. A view from Stop 3, the Olompali State Historic Park, towards the south. From here you can see the silted-in former bay margin formerly used by California Natives for hunting and gathering prior to the 19th century. The perennial stream that graces Olompali State Park provided plenty of fresh water and fresh fish then. Also located at the park, are the fire scared remnants of a formerly magnificent historic mansion that incorporated an earlier Spanish era adobe structure (visible within). The building and lands were formerly owned by the Grateful Dead, until that fateful night in 1969. That is the beginning of the story of state ownership! 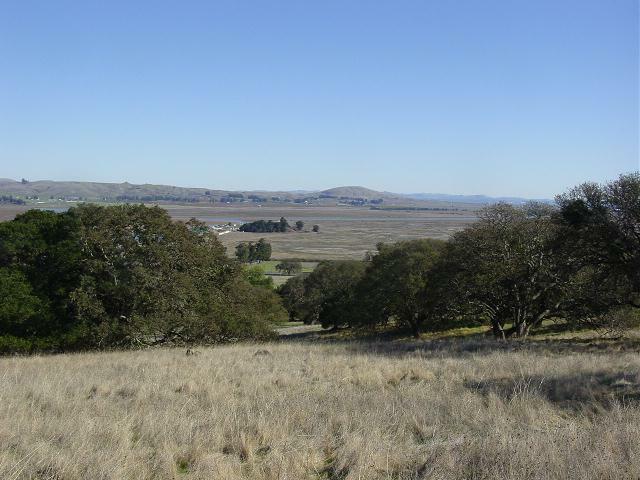 The Burdell Mountain Fault at Olompali State Historic Park. Dan Day and John Wakabayashi discussing the issues at Stop 4. A view south from Stop 5 in the northern edge of Novato. The purpose of this stop was to visit a knob of flow-banded rhyolite on a southwestern ridge of Burdell Mountain. This rock, with an Ar/Ar age of 11.1 Ma, is lithologically similar to the Northbrae Rhyolite of the Berkeley Hills, dated at 11.5 Ma and on the east side of the Hayward fault some 40 km to the southeast. The Burdell Mountain and Quien Sabe sequences, however, have no match in the Berkeley Hills. What else but a group shot at Stop 5! Field Trip Coordinator Jean Moran thanking Rick Ford with a few gifts for his time and effort in leading the NCGS on a very educational day. 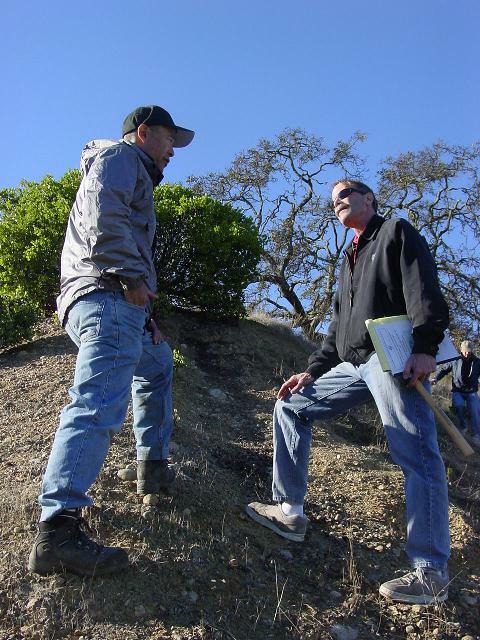 There is still work to be done in this North Bay mapping project and we can look forward to significant new results at the Spring 2005 Joint Meeting of Pacific Section AAPG and GSA’s Cordilleran Section, in a symposium being organized by Bob McLaughlin and Dave Wagner.